Make perfect bacon every time. You’ve heard it said that my husband brings home the bacon and I fry it in a pan. Actually, I bake his bacon in my oven. I’ve been making bacon like this for 22 years. In fact, it is such second nature to me that I’m always surprised to learn that some people don’t know how to do this. I learned it while waitressing at The Chalfonte Hotel in Cape May, New Jersey, back in the late 80s and early 90s during my college summers. Dot and ‘Ceelie taught me. They learned it from their mama, Miss Helen Dickerson and have been doing it that way forever. It is the only way to make bacon for a large restaurant crowd. 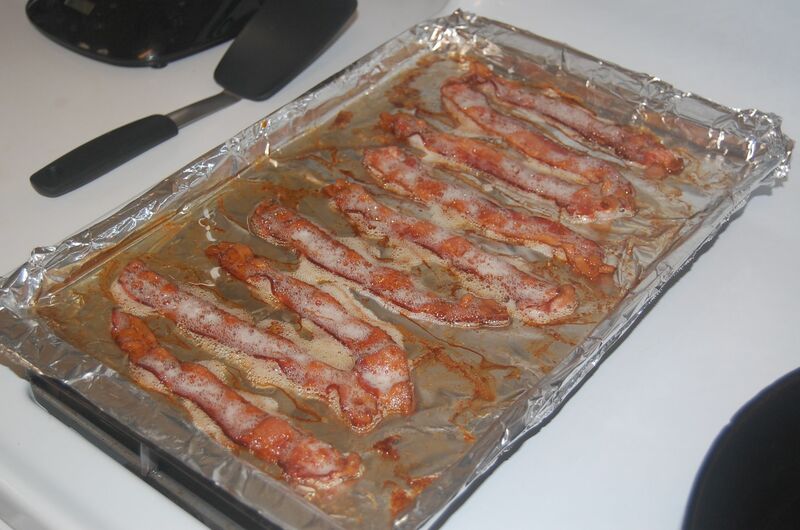 Baking your bacon in the oven is easy to do and easy to clean up. The bacon cooks evenly and doesn’t splatter, so less mess and less burns. And while it’s baking, you can tend to your other breakfast dishes. It’s really a no brainer. Just bake it. 2. 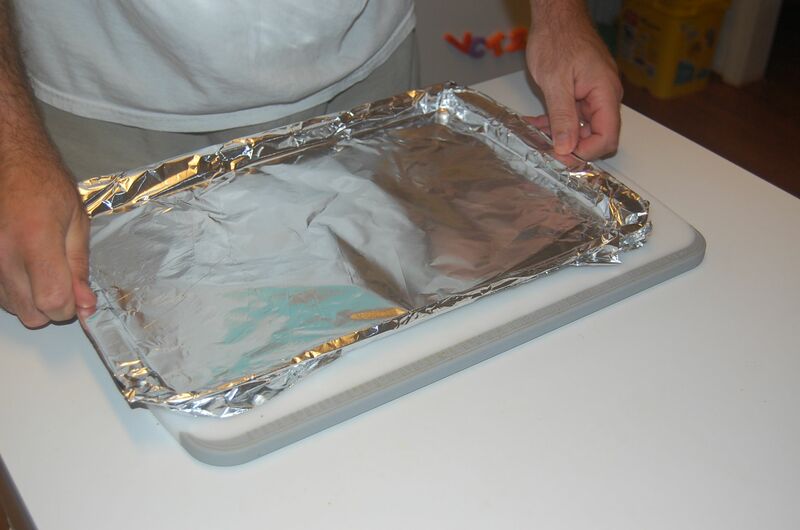 Cover a rimmed baking sheet with foil for easy cleanup. 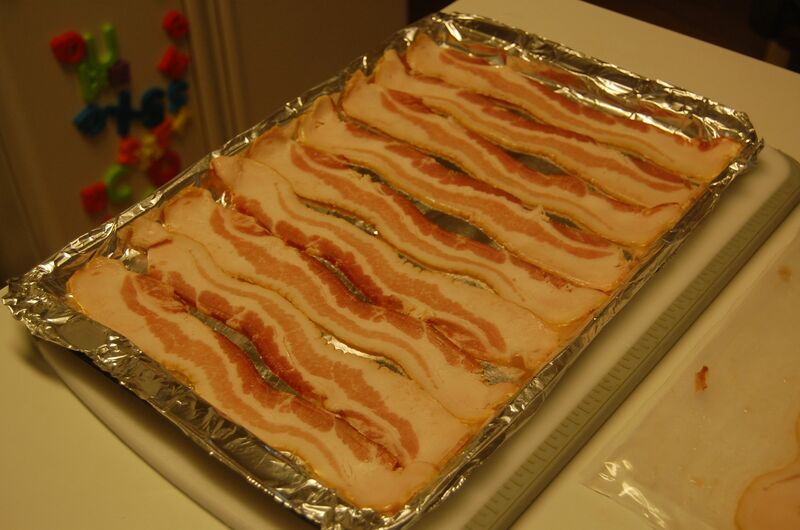 TIP: Keep your bacon in the refrigerator until you are ready to place it on the baking sheet. The colder the bacon, the easier it is to use. Room temperature bacon is slippery and slimy. 3. Lay your bacon out on the foil covered baking sheet. We use a metal jelly roll pan. It’s okay for the bacon to touch each other, but try not to overlap it or it will end up sticking together. 4. Stick it in the oven on the middle rack. Check it after 12 minutes, but you might need to cook it for 14-15 minutes, depending on how thick it is and how crispy you like it. 5. 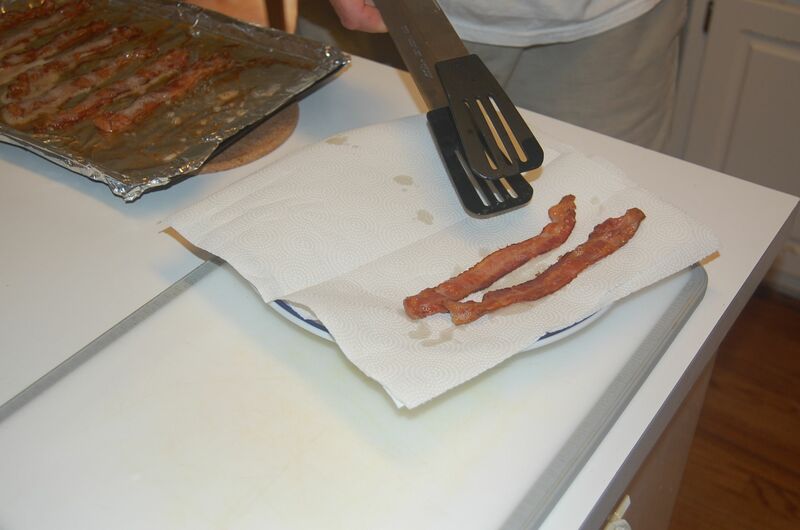 When you pull the tray out, transfer the pieces of bacon to a paper towel lined plate. Use another paper towel to blot the top of the bacon. I decided to keep the bacon grease this time for future use. We poured it into a mason jar and we’ll keep it in the freezer. (When it’s frozen, it will look much less like a urine sample. Thanks Keeley!) It will be perfect for a batch of fried corn later this week. But if you aren’t going to keep your bacon grease, you can just toss your blotting paper towels onto the greasy foil tray and then ball up the foil and toss it in the trash. 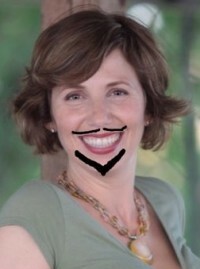 Voilá, your clean up is done. Looking for more advanced bacon baking moves? Try heart shaped bacon bites, bacon cups, or bacon weaving. And if you’re seeking to take your bacon obsession to the next level, perhaps you would consider a bacon bra. Nothing says “Nice to meat you!” like bacon scented boobies. My husband would LOVE bacon-scented boobies. Well there you have it then… think of me on his next birthday as you are lovingly wrapping each of your breasts in smoked pork products. Um, fried corn?? Please explain further. Oh yes, fried corn! My mom taught me this one and it is one of my favorites from childhood. You just cut the corn off the cob (I usually do one ear of corn per person) and saute it in bacon grease until it is golden brown and crispy. It is ridonkulously tasty and probably just horrible for you. Maybe have a CPR certified friend on call while you eat it. I cook bacon this way too. Its so easy that I could cook bacon that way every single day. My friend does a very similar baking method. She buys a spicy thick-cut bacon. Halfway through baking, she drizzles with maple syrup. Thanks for reminding me of this. Jonathan has been requesting more bacon for a few weeks now. OMG – that sounds amazing! I will be trying that this week. Thanks Mads! This is how I do my bacon also. It’s so easy. I’ve never even attempted frying it in a pan. WORD. I have NEVER fried bacon in a pan. Don’t even know how. I love to cook bacon in the oven. Next time, cook it on top of a cooling rack over your pan! Makes for less grease ON the bacon. 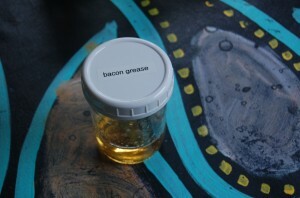 I wouldn’t be a bit surprised if my urine had bits of bacon floating in it. Overshare? Great minds think alike Keeley. 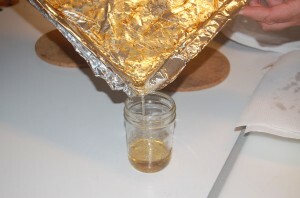 If you hover over that pic, the title is something about a urine sample! Maybe I need to make it a caption instead. Thanks for the feedback! And I forgot to say, thanks for the baking rack tip! I would try that, except I’m so lazy that I don’t want to have to wash the baking rack. But one of my Twitter buddies just told me to put a piece of parchment paper on top of the foil because it absorbs a lot of the grease, better than the paper towels. I will try it and report back! I love a woman who is fluent in Baconese. You know it. In bold. And underlined. Freudian slip? I think not. Whatever that means. Filthy probably. I love baking it in the oven. I, also, started putting it on a cooling rack over the lined jellyroll pan. When we go camping now I bake the bacon first, and then wrap it in foil and take it along. I heat it up in the morning and don’t have to worry about grease and clean up, but still get the amazing bacon. I’ve recently discovered chocolate covered bacon-it’s really the only way I like it. But then who doesn’t like chocolate covered anything?! When I was pregnant with my daughter, I craved chocolate chip cookies wrapped in bacon. I bet chocolate covered bacon would be heavenly! I just want you to know that I’m breaking my 3-week vegetarian streak to try this bacon tonight. My husband might actually offer to father your children based only on the mere insinuation that I MIGHT try this based on your blog. He really misses pig. Er, bacon, that is. “Missing pig” is not some kind of oddly phrased sicko joke about the porking insinuation I made back there. That was totally just a turn of phrase, not a threat or anything. There will be no fathering involved. I guess. I mean, you never know what might happen when there’s pork involved. OK I’m just going to stop now. Clearly the prospect of meat is driving me over the edge. First…did you say “TA-DOW”?…..might have to give you an honorary membership into the brothahood. 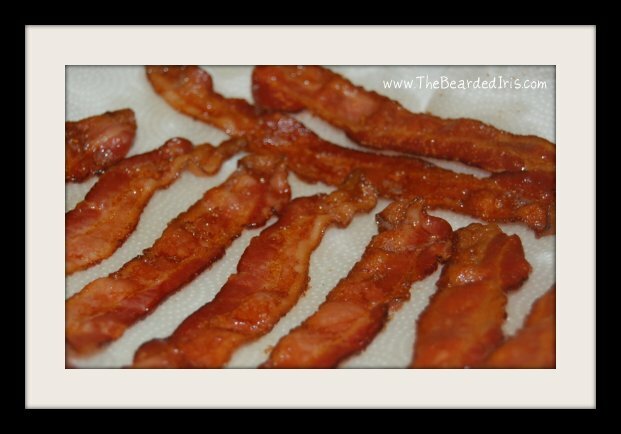 Second, that photo of cooked bacon is better than any artist can ever depict. I think I’m in love.